Viet Nam has experienced robust wage growth while a new ILO report shows a worse slowdown in global wages. The country, however, still needs to address many challenges, including the informal economy, low productivity and widening gender pay gap. HANOI (ILO News) – Viet Nam has done well in terms of wage growth compared to the world as new ILO figures show a continuing slowdown in global wages, particularly in developed countries. 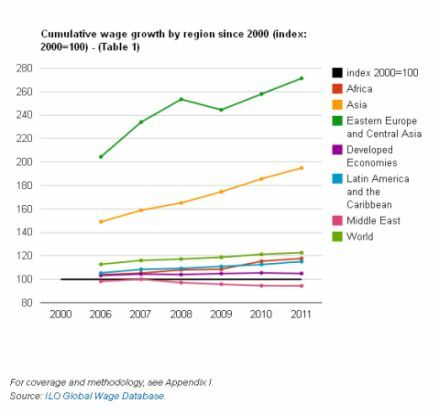 According to the ILO Global Wage Report 2012/2013 launched in Switzerland today, wage growth remains far below pre-crisis levels around the world. Globally monthly wages grew by 1.2 per cent in 2011, down from 3 per cent in 2007 and 2.1 per cent in 2010. The report points to huge differences between countries and regions, with wages generally growing faster in areas where economic growth is stronger. While real wage growth suffered a double dip in developed economies – where it is forecast at 0 per cent in 2012 – it remained positive throughout the crisis in Latin America and the Caribbean, as well as Africa, and even more so in Asia. 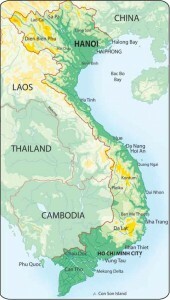 In Viet Nam, between 2006 and 2010, the average nominal wage increased 26.8 per cent per year. Even when taking into account inflation, which remained high, the real wage increased by 12.6 per cent on a yearly basis. Like Viet Nam, the wage growth in Asia and the Pacific has continued to remain at high rates (6.3 per cent in 2010), reflecting the region’s resilient economic performance during the crisis. However, there are considerable differences in wage levels across countries and regions. A worker in the manufacturing sector in the Philippines took home US$1.4 for every hour worked, compared to less than $5.5 in Brazil, $13 in Greece, $23.3 in the US and almost $35 in Denmark, according to the ILO report. While the report shows global trend of wages has grown at a slower pace than labour productivity, the situation in Viet Nam contrasts sharply. In developed economies, labour productivity has increased more than twice as much as wages since 1999. Even in China – a country where wages roughly tripled over the last decade – the labour share went down as Gross Domestic Products (GDP) increased at a faster rate than the total wage bill. The global trend has resulted in a change in the distribution of income, meaning that workers are benefiting less from the fruits of their work while the owners of capital are benefiting more. However, opposite to the global situation, the real and nominal wage growth rate in Viet Nam has been at least three times higher than the growth rate of labour productivity. One of the reasons is that like in many other developing countries, average wages refer to the earnings of paid employees who represent only 33.8 per cent of the total labour force in Viet Nam, while labour productivity measures GDP of all employed people, including the self-employed. According to ILO Viet Nam’s Senior Industrial Relations Specialist, Yoon Youngmo, the Government has used minimum wage as a policy instrument to gradually raise the wage floor over the last few year, with more than 20 per cent increase each year. According to ILO Viet Nam Country Director Gyorgy Sziraczki, Viet Nam has some other challenges ahead to make the wage growth equally benefit the country. “The policy efforts should focus on the nearly 60 per cent of the labour force that remain in the informal economy with low productivity, little protection and low income,” he said. He also warned about the widening gender pay gap in Viet Nam. While gender pay gap has declined in the crisis years in most countries in the world, according to the ILO report, Viet Nam is among a few nations that have seen a widening gap – nearly 2 per cent increase in 2008-11 compared to 1999-2007. “Unless women are paid equally for their no less important contributions in the world of work, the country cannot tap the huge potentials of about half of their labour force,” said Mr Sziraczki.